SHARJAH: Pakistan beat Sri Lanka by seven wickets in the fourth day-night international in Sharjah on Friday, taking a 4-0 lead in the five-match series. 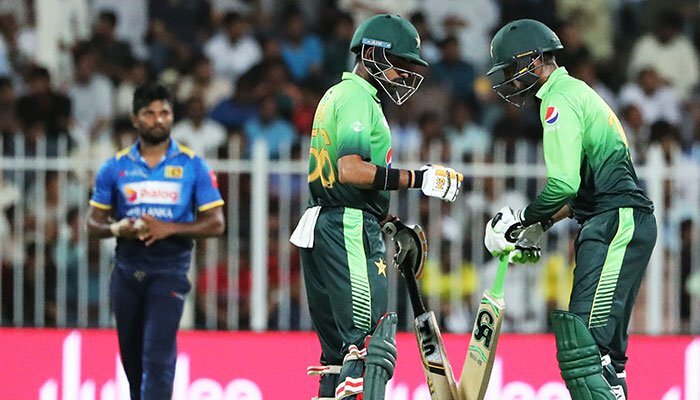 Babar Azam and Shoaib Malik both scored 69 not out and were responsible for propelling the team to another win over the beleaguered Sri Lankans. Debutant centurion Inam-ul-Haq and Fakhar Zaman returned to the pavillion after contributing a mere 19 runs and were soon followed by Mohammad Hafeez who made 9. The innings stabilised after Azam and Malik made a stand and kept the scoreboard ticking, pushing their team towards another victory in the five-match ODI series. Earlier, Sri Lanka´s woeful batting continued as they were bowled out for another paltry total of 173 in 43.4 overs by Pakistan. Medium pacer Hasan Ali (3-37) and spinners Shadab Khan (2-29) and Imad Wasim (2-13) were the chief destroyers as only Lahiru Thirimanne resisted with a 94-ball 62 on a flat pitch at Sharjah stadium. Already trailing 3-0 in the five-match series, Sri Lanka were off to a disastrous start when their in-form skipper Upul Tharanga was bowled by debutant left-arm pacer Usman Shinwari for nought off his second delivery. Shinwari was one of two changes Pakistan made from the third one-day which they won by seven wickets in Abu Dhabi. Also brought back was Wasim. They replaced Fahim Ashraf and Rumman Raees. Sri Lanka had made three changes, with Sadeera Samarawickrama making his debut but not much changed for them. Another left-armer Junaid Khan ended Niroshan Dickwella´s enterprising 16-ball 22 studded with three boundaries and a six while Dinesh Chandimal was run out for 16. Samarawickrama lasted just two balls without scoring before Thirimanne and Milinda Siriwardana (13) added 32 for the sixth wicket. Hasan broke a resolute eight-wicket stand of 43 between Thirimanne and Akila Dananjaya (18) before Wasim ended Thirmianne´s resistance in the 41st overs. On Thursday, Pakistan were dealt a blow when veteran all-rounder Mohammad Hafeez was reported for suspect bowling action for the third time.